It's a Jolly Holiday at Walt Disney World! Christmas is our FAVORITE time of year at the parks, but it comes with its downsides. If you'll be spending your holidays dashing through the crowds at Walt Disney World or any of the Orlando theme parks this holiday season, you will likely get quite close with many guests, as crowd levels are at a peak! 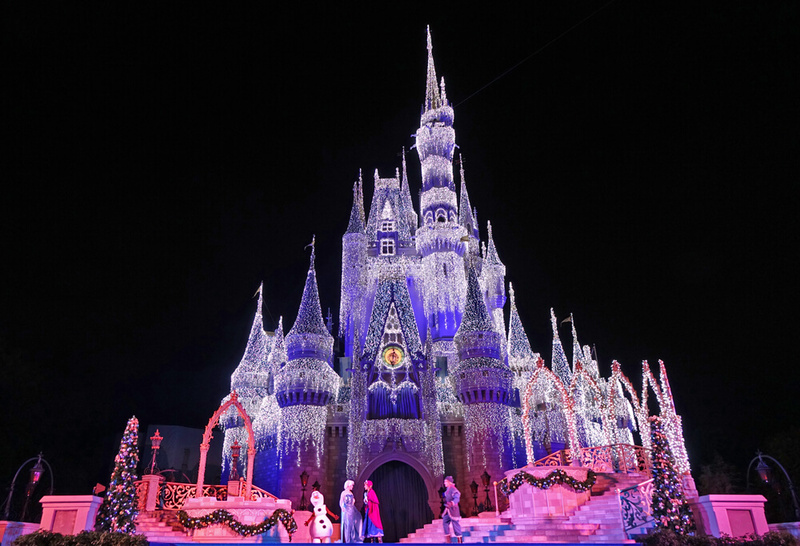 While Disney World is an amazing place to visit during the holidays, the parks can be packed. If you're heading to Orlando on a "red" — or high crowd day — this post is for you! 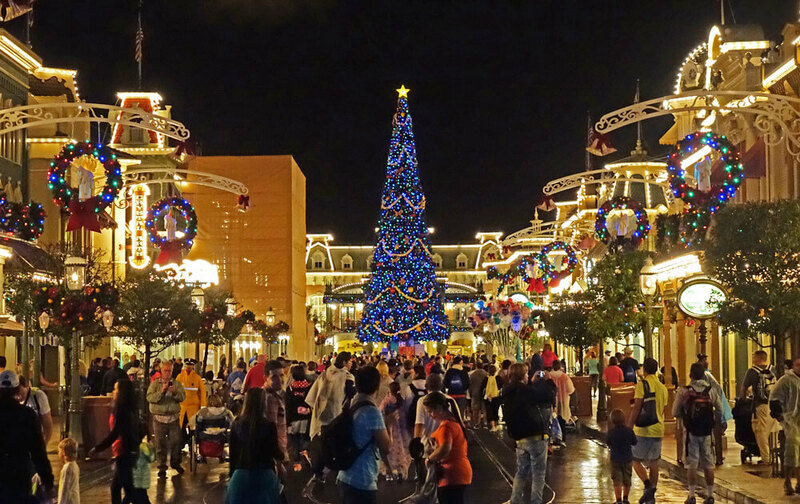 Here are the best tips for handling the Disney World holiday crowds. As soon as you're reservation window opens (60 days in advance of check-in for resort hotel guests and 30 days in advance for non-resort guests), make sure to book FastPasses for the most popular attractions such as Slinky Dog Dash at Disney's Hollywood Studios and Avatar - Flight of Passage at Disney's Animal Kingdom. 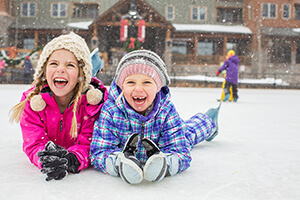 We offer park plans that are great for crowd level 5s, 6s, 7s and 8s. These levels cover most of the season, so they can help ease the stress of Disney World holiday crowds. If you download our printable plans, you'll find additional park plan maps, plus packing lists for the whole family. 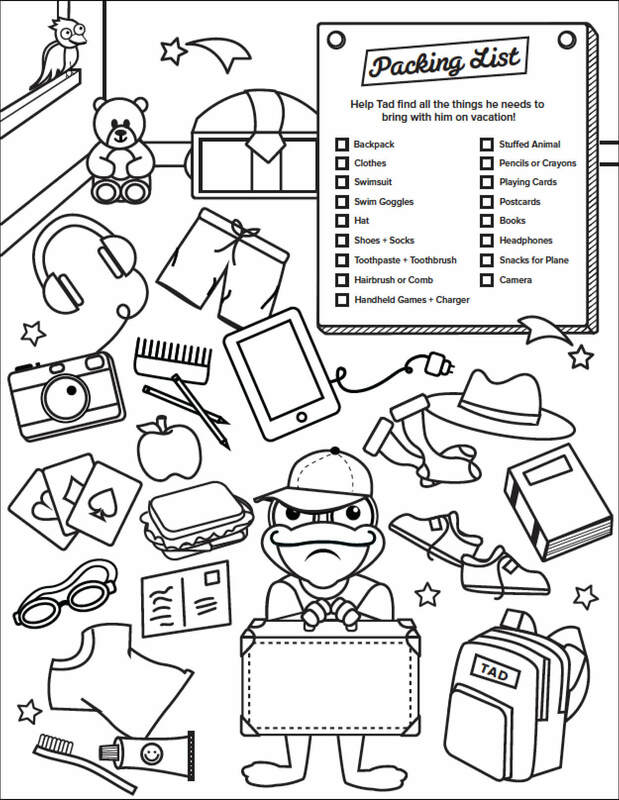 For the tadpoles, make sure to print out our packing list coloring page that they can use to help with the planning. On the handful of days when it is more busy that that, especially Christmas Day and New Year's Eve, it's better to set a few priorities for each family member. Get to the parks early so you can experience any priority attractions you don't have FastPasses for. You're not going to be able to do and see as much when crowds are at their highest. Factor in more time for everything. Be flexible and set realistic expectations for the whole family. Make sure to take some deep breaths, plan some chill time and enjoy the bonding. 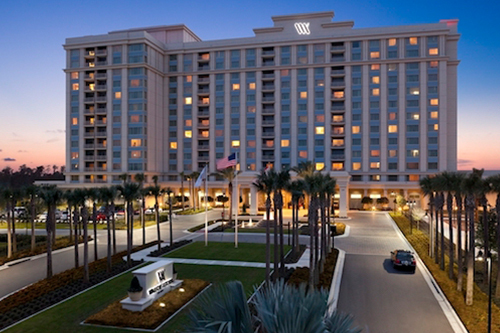 As mentioned above, our Orlando Planning App offers pre-set and customizable touring plans. It also has park schedules, show times and wait times in an easy-to-use interface, so it's a great tool for managing Disney World holiday crowds. We've added a map feature, so you can easily navigate and see your plans and wait times. 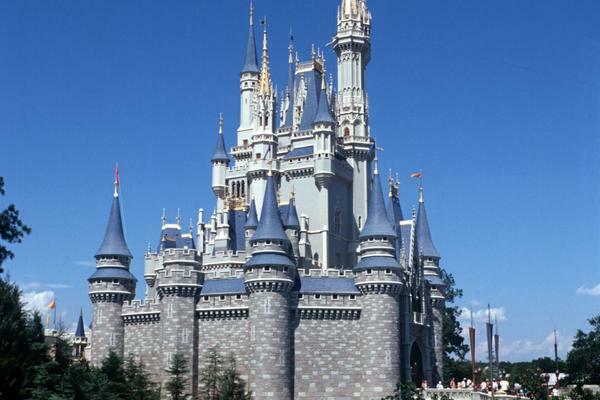 It won't drain your precious battery life, and it covers Disney World, Universal and SeaWorld. Best of all, it's FREE. You definitely don't want to leave home without downloading it! The most tested time-saving tip is to arrive early, and this is mostly true with Disney World holiday crowds. Arrive at the Disney World parks about an hour before rope-drop and ride your favorites in the first hour or two before the lines get really long. The exception to this is if a park has morning Extra Magic Hours and you are staying off-site. Pick another park if you can. This is unavoidable during the busiest days at Magic Kingdom. You can still arrive early so you get in when the park officially opens, but it will be more crowded. If you are staying on-site, congratulations! Make sure to take advantage of Extra Magic Hours, and if you have night owls, take advantage of the late Extra Magic Hours. Park hopping is not recommended during the very busiest times — crowd level 9s and 10s — especially if you're a first-time visitor. If a park reaches capacity, you won’t be allowed re-entry. Plus, moving between parks takes up a lot of time. The special holiday versions of the parades and stage shows draw large crowds, so save a viewing spot an hour before show time. Yes, we said an hour. Use our app or grab a times guide at the park entrance. A common mistake (and a sure-fire way to miss a parade or show) is to underestimate the time it takes to get from point A to point B. We like to fuel up in our hotel room or even splurge on the occasional breakfast buffet (Boma at Disney's Animal Kingdom Lodge is our very favorite!) before we head into the parks. If you eat a hearty breakfast, you can go lighter — or even skip — lunch. This helps you beat some of the Disney World holiday crowds during mealtime! You can also bring your own snacks and water bottles into the parks, or even a full picnic lunch. The restaurant crowds can be busier than attraction lines when the parks are packed. A picnic lunch in a less busy spot in the park is a great way to regroup and save money. If you're going to eat at the restaurants while you're in the parks, save your line time for the fun stuff by eating during off-peak hours and using mobile ordering. Restaurants inside the parks get busy around traditional dining times — 11:30 a.m. to 1:30 p.m. for lunch and 5:00 p.m. to 7:00 p.m. for dinner. Consider having those big meals outside of busy times. Most restaurants begin serving lunch at 11:00 a.m. and dinner at 4:00 p.m. Plan your dining times around any shows or parades you want to see. 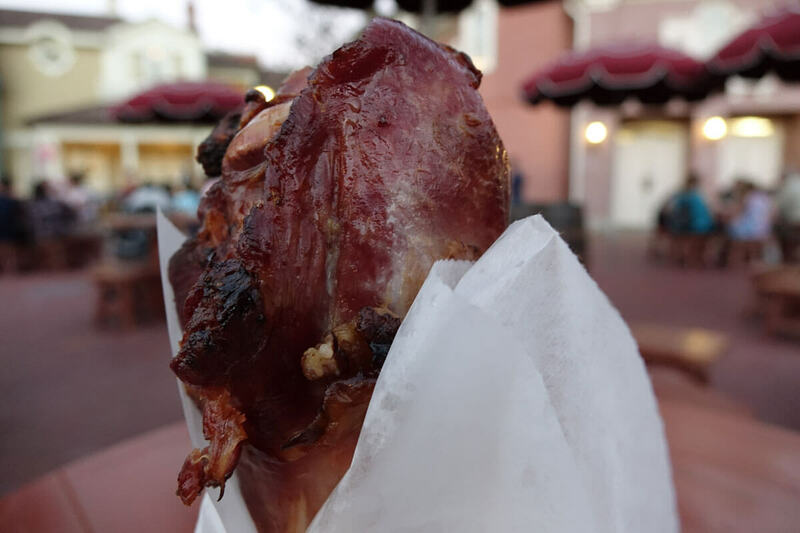 Keep your hunger satisfied with a turkey leg or fresh popcorn. Crowds + tadpoles (children) = sky-rocketing anxiety levels for parents, especially with the Disney World holiday crowds. Review things like “what happens if we get separated” beforehand. 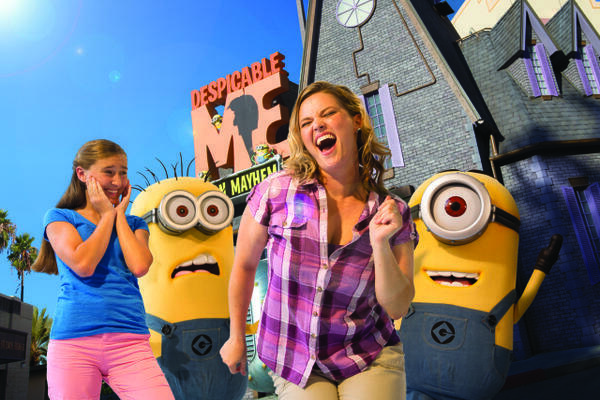 Take a look at Lily’s theme park safety strategies for more tips. If you pass a restroom and the line isn’t too long, GO! Even if you think you can wait … GO! You'll thank us later. It’s easy to get carried away, especially during the holidays. We give Tad and Lily a souvenir allowance to spend as they wish. My wife and I also surprise them with souvenirs we purchase in advance at a much lower price. And it’s not just the kiddos who hate hearing, “No dear, you can’t have that.” I think I may have the hardest time of any of the frogs passing up the goodies! If you or your little ones are completely frazzled by the afternoon, take a break from the parks completely. One alternative is Disney Springs. During the holidays, there are Toy Soldier and Reindeer stilt walkers, live holiday music, dining, shopping … and SANTA! Do keep in mind that Disney Springs can be just as crowded as the parks during the holidays, so if you want to avoid that, go early in the day. The Frog Family also really likes strolling along Disney’s BoardWalk Entertainment District. There are shops, restaurants, a dance hall and carnival-style games. 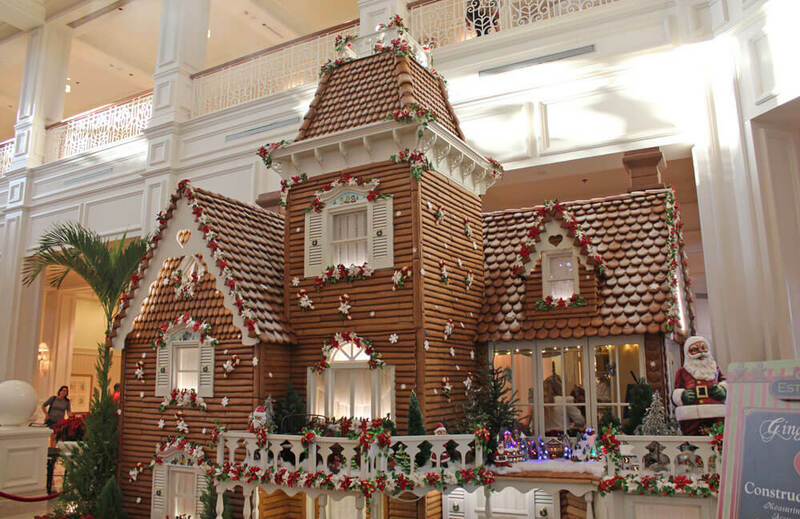 Another fun thing to do around the holidays is to take a tour of the Disney World resorts. You can take in all of the holidays decorations and Christmas trees decorated to the nines. Disney's Animal Kingdom Lodge and Wilderness Lodge have gargantuan trees that are absolutely amazing inside their already spectacular lobbies. The other deluxes (minus Disney's Polynesian) offer oversized gingerbread displays that are works of art in their own right. 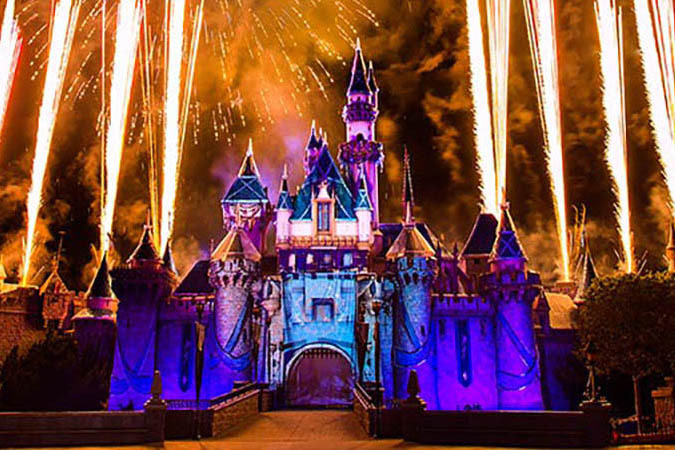 Along the same lines as the previous tip, consider watching the fireworks from outside the park. By doing this, you can have a less stressful time fighting the Disney World holiday crowds and getting back to your hotel. Many people don't realize it, but you can see Magic Kingdom's fireworks from afar. 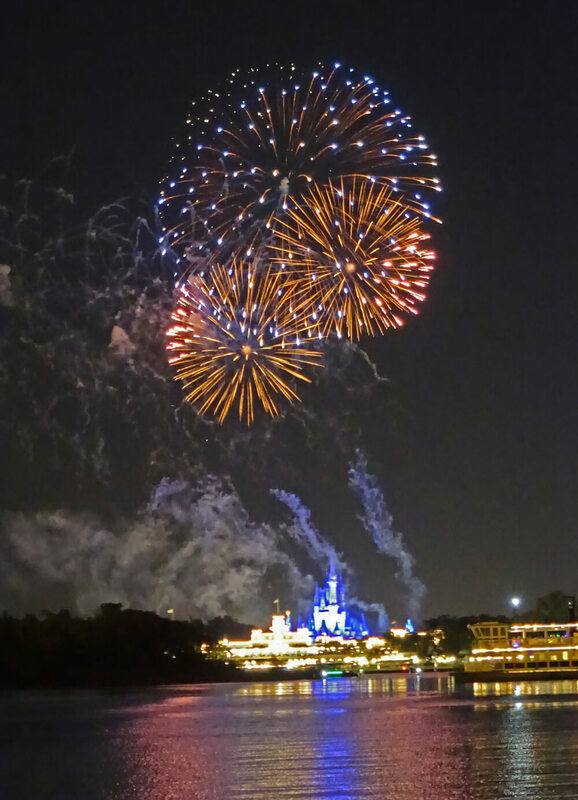 Magic Kingdom fireworks shows are viewable from the beaches at Disney’s Fort Wilderness Resort & Campground, Grand Floridian Resort and Disney’s Polynesian Resort, and on the boat ride between Magic Kingdom and Fort Wilderness. Additionally, the fireworks can be seen from California Grill at Disney's Contemporary Resort. You need a reservation for this, but it can be for any time in the evening. Just save your receipt, and you can come back up later to watch! I must confess this is my favorite place to watch the fireworks, because you're watching from above. It's one of the only places I know where you really see the whole show. The music is "piped in" at each of these locations. While I love when a great plan comes together, I know when it’s OK to alter that plan and change course. Take occasional “temperature” checks of everyone’s energy levels and attitudes. If you have to cut something short or go to a different park than you planned, don’t sweat it. It’s about quality, not quantity. And when you're trying to navigate through those tough Disney World holiday crowds, flexibility is key! Whew! 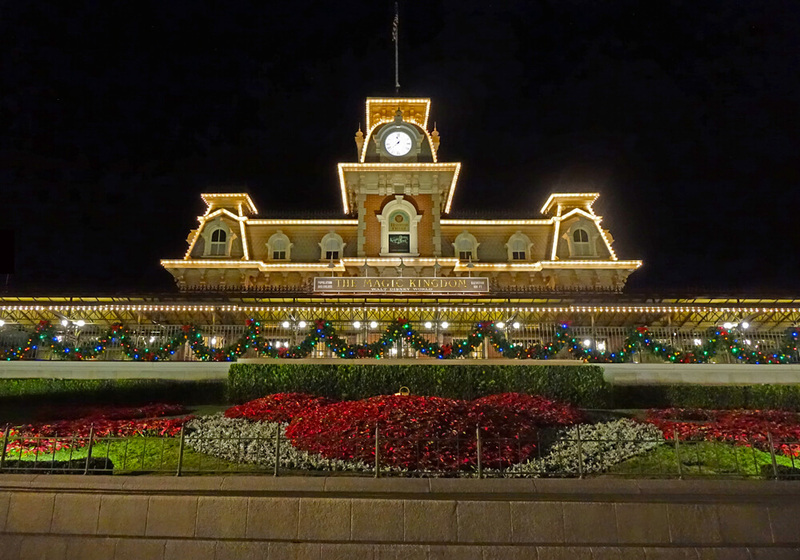 There you have it — our top tips for successfully managing the Disney World holiday crowds. Have a tip for navigating the parks during the busy holiday season? Spread some joy and share it in comments below! And hop over to our When to Visit Orlando page inside the Orlando Planning Timeline! Are the holidays decorations and parade and hot chocolate still happen between December 26-December 31? Dates for this year have not been released just yet, but last year, Mickey's Very Merry Christmas Party (with the hot cocoa, cookies and special parade) was only held through December 21. We might be heading to Orlando the first week of January. 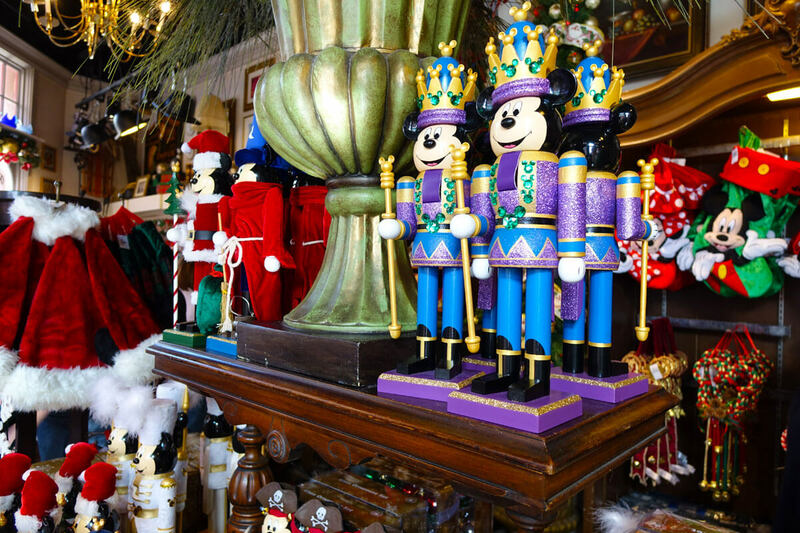 Is there any word on a date that the Christmas festivities (decorations and parades) will be done in Disney? Based on past years, we are fairly certain that all holiday decor will still be up during your trip. Some holiday entertainment (like Jingle Bell, Jingle BAM! at Hollywood Studios) will take place through the first week, while Festival of the Holidays at Epcot will have ended, as well as Mickey's Very Merry Christmas Party at Magic Kingdom. MagicBands aren't completely necessary, but they can help keep up with tickets if you have a large party and are afraid of losing tickets. They also make great souvenirs, and you can reuse them for your next trip. Packing your patience is key! We were on a dead run in the morning to see what we could early and not be turned away when the parks reached capacity. I found the UndercoverTourist crowd calendars very helpful when I went to disney last year.. Yes, you'll have to have the tickets first in order to book FastPass+ reservations. 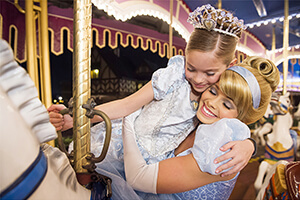 As soon as you receive the tickets, you can then book the FastPass+. Hi we will be in Orlando from Dec 28th-Jan 5th. We.will be doing 1 day at magic kingdom during this time. I was hoping to go before Dec 31st. In your experience what would the difference in crowds be comparing Dec 29th or 30th to say after New Years. According to our crowd calendar, you can expect about the same amount of heavy crowds during that time. We are visiting over New Years and plan to be in the Magic Kingdom on NYE day. Fast Passes have been secured! According to the Disney website, the parade and fireworks schedule for 12/31 (and 12/29) in the Magic Kingdom are "unavailable." Do you know what this means? My hope is they are still working out the schedule given the crowds. My fear is that the park is somehow full and we will miss the shows. Thanks very much. This usually means they are still working on the schedule. Hmm. A 60-day window from today would be around Dec 5th. The Christmas week availability would not open until later this month. We are planning our first Christmas family trip to WDW from dec 23rd to 30th. We want some advice on which tickets to purchase if we are 8 young adults, a 9 month and a 5 month. 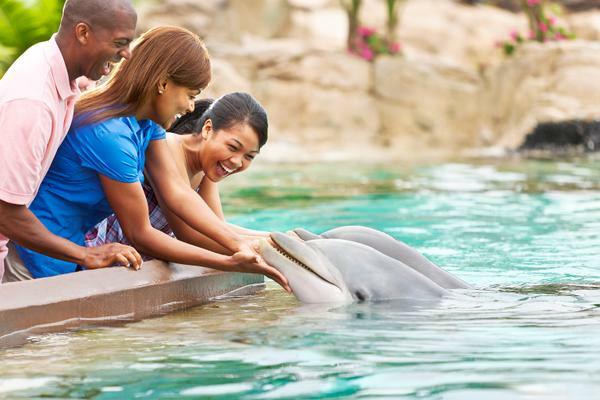 The most popular ticket for families is the Park Hopper with Plus option. 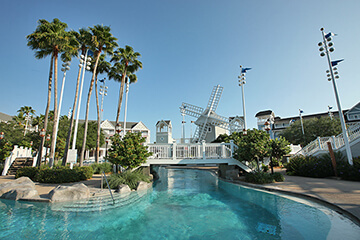 It will allow you to hop between parks, and visit other attractions such as the water parks and mini-golf. If that's not for your family, then the Park Hopper will give you lots of flexibility. when is the best, least crowded time to see ALL the christmas decorations and shows? Looking at our Crowd Calendar, we're forecasting average to low crowds in December leading up to the 21st. As for the decorations, are you including the hotels as well? Some of them are not decorated until the first few weeks of December. The theme parks should be all decked out by Thanksgiving Day. You'll find that some of the Disney World parks and resorts have their holiday decorations up by the second week of November. Still more decorating is in place by the week before Thanksgiving. We are hoping to go to Disney starting November 4th through the 11th. Will Christmas items not be out at this time? Wondering if we should push our vacation back by a week but am afraid of crowds and cooler weather. The park usually starts decorating starting November 1st. If you go that early, know that the Small World Holiday and Jingle Cruise holiday overlays may not be up yet. If you can go the week before Thanksgiving week, all of the holiday decorations and installations should be up. If you watch the EPCOT illuminations show from the boardwalk bridge, as far as I know, you can't view the full show such as the globe with the fire and the images projected onto it. And the music is not piped in. But yes, the sporadic fireworks of this show are visible from here. In order to do this, which is in Magic Kingdom, and Disney's Hollywood Studios in one day, you would need to purchase Park Hoppers. 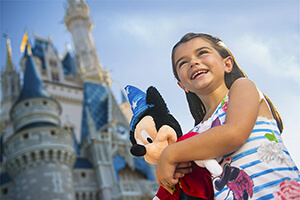 You can view all of our Disney World ticket options on this page. Another option would be to make dinner reservations at the California grill restaurant in the contemporary perhaps 45 minutes before fireworks time at the magic kingdom and ask for a window seat. Or watch them outside from the bridge between the contemporary hotel and bay lake tower, but they may not let you park there without a dining reservation. Hi, any advise is appreiated we are planning on going to WDW Christmas week just for a day as we will be staying with my in-laws who live there. Trying to find where the Star Wars people dance to music on stage? My 10 yr. old watches them on KidsYoutube and it says Hollywood Studios but when I've looked on here I don't see any show times or know what the shows are called. Anyone know what and when they are? I think your tadpole is thinking of March of the Star Wars: A Galaxy Far, Far Away stage show. There are multiple showtimes daily. We are planning to go Dec 16-22 which is right before Christmas and will be our families first time for all of us including parents. Park hoppers or no? What is must have and must do being our first time? We have 3 boys and a girl. Are we crazy going our first time in Dec? You can do it! 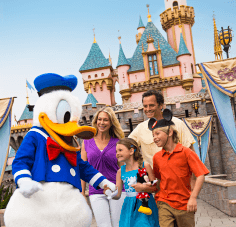 Have you seen our quick-start guide for Disney World? It offers experiences popular with boys and girls. Unless you feel strongly that you want to hop, we generally don't recommend them for first-timers, who will spend more time taking everything in. I am going to Disney World after christmas (27, - jan 2nd) Any advice on what day to go to what park? Will the best New years bash be at Magic Kingdom? 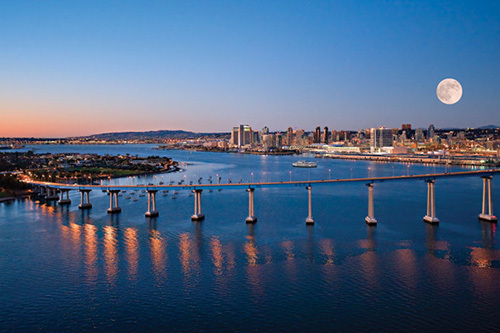 When do the Osborn light show end? Do i need to go the first day just in case? Any advice will be appreciated. 1. Have a stroller if the kids are young enough - the stroller allows you to control your kids movements and through a heavy crowd, they won't get bumped as much. You can move much quicker through the park. 2. News Years Party - The Magic Kingdom has two New Years Eve fireworks shows - one on the 30th and one on the 31st. I'd recommend the one on the 30th. It's just a bit less crowded. Not much but enough. It's the same as the one thrown on the 31st. 3. Character Dining (Breakfast mostly) - This isn't for everyone because of the expense but if you can schedule a character dining experience very early in the morning at the park you're visiting that day, it's not a bad idea. You'll be in the park before anyone else, get pictures with characters, have a great breakfast (depending on where you go) and start off the day a bit quieter. 4. Enjoy the resorts - the resorts are nicely decorated and will be less crowded than the parks. 5. Don't plan on seeing everything - I saw the stuff the kids enjoyed and didn't care if I saw the rest which really helped in making sure we stayed relaxed the entire time. 6. Parties - The parties are decent at the Magic Kingdom and Epcot. Epcot is more geared towards adults as there seems to be a theme of "drinking around the world" for a lot of people that go. 7. Dining - reservations are encouraged as even the quick service dining locations fill up... quick. If that doesn't work, bringing your own meals (pb&j sandwiches, crackers, fruits, meal bars, etc.) can help. You can ask for water at most restaurants. They hand out cups for free. In any case, I hope you have a great time! Thanks for sharing—these are great tips! The Osborne Lights will not be back at Disney's Hollywood Studios this year, but there are always rumors floating around about a reappearance. Our family solved the souvenir problem...we gave each child a set amount-usually about $20. This was their Disney allotment for souvenirs-their choice, their money. We bought no other souvenirs for them. We told them that they could keep whatever money they did not spend...many trips a few of our children came back with almost all their funds! Plus, we didn't have to hear, "Can you get this for me?" It was more enjoyable for everyone, and we didn't have to say NO constantly. 17. We wpuld split up in day sometimes (excellent time to use the single rider lines) We had park hoppers ( we didn't have any issues around parks being at capacity - but on NYE we stayed in the MK... Just in case) generally we slept in, used fast passes well, and stayed at the parks REALLY late (sometimes as late as 2am bc of PM EMHs) we all had a great time, went on all the attractions that were important for us. My wife and I will be visiting WDW for four days around New Years (28th, 29th, 31st, and Jan 1st) and understand the chaos the we are signing up for. My question is to hop or not to hop. My first instinct was four parks, four standard tickets. Made sense. But then park hours made me doubt myself. Leave for the day when Animal Kingdom closes or get three or four more hours by heading over to the Magic Kingdom. Also, we'll be early birds and night owls, but probably won't want to stay open to close. I fear leaving our park of choice mid afternoon and being denied reentry that evening and because we have standard tickets, we would have no options to go to try another park. Even with these concerns, our trip advisor swears we're just throwing money away for the hopper option. Your advice is geeatly appreciated. Park hopping is a personal decision, so you have to go with what you think will work best for you. Magic Kingdom is the most likely park to reach capacity and hopping to it or getting back to it after a break might be your biggest bottle neck. Now, if it reaches capacity, you would not be allowed admittance until it is again below capacity. So it doesn't mean you wouldn't get back in for the day, but you might not get back in right when you show up, if that makes sense. With the hopper, you would have the flexibility to move to another park that had not reached capacity. As to your decision on whether to park hop, you should factor in the length of your stay and whether you are a first-time visitor. 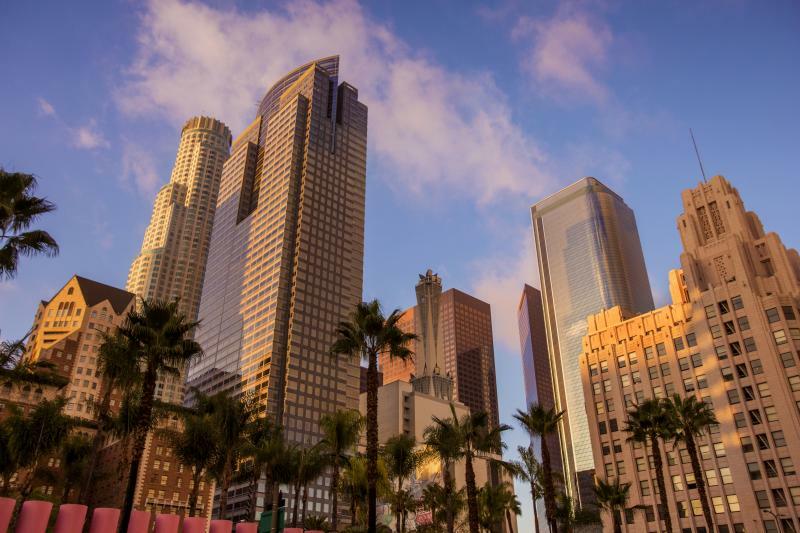 If you are first-timer, you don't yet know which parks you will enjoy the most. Since you are there for four days, you would likely visit a different park each day. Having the park hoppers would allow you to revisit your favorite parks in the evenings. My mom was the worst on our trips. I knew we were hosted by a friend in management but the whole trip there she kept saying "What if we are going 1000 miles to find out he wasn't serious about getting in for free." I then just told her, "Well, we can have fun at Downtown Disney and then hit Old Towne in Kissimee." Well she was cynical as we walked up to meet the friend and he pulls out his ID and badges in all 6 of us. Then mom started her, "Well, we are here, now we have to figure out where to go." But the friend didn't just bail out. He guided us to Soaring and took all our park ID's the machine had generated. He then met us at the end of Soaring and gave us the printout for our fast pass reservations at the rest of the rides in Epcott. He then gave us good suggestions on food options and we set about our day. It was fantastic and we had the most fun, even mom came out of her negative shell and had some fun. We ended our day with 10 rounds of Spaceship Earth then the fireworks. Is Disney offering a dinning discount during non peak hours of the day? They offered a discount 2 years ago when we visited Disney for Christmas and we found out about it at Undercover Tourist. Please let me know if this discount will be in effect this year. I have not heard of this discount being in effect right now. WDW-DINE and dinner reservations online are great! You can plan ahead of your visit and take a break with a nice lunch or dinner. Be on the look out for restaurants that include characters such as the Crystal Palace at MK, and special packages at EPCOT that include VIP acces and seating for the fireworks and the Candlelight Processional! Making reservations also gives you an idea of how the park is going to be like, some restaurants are out of reservations since Midyear. We have been to Disney once per year for the past 6 years, always during Easter Week which is touted as being just as busy as Christmas week. We have young children and have had great success with getting up early, eating a quick breakfast, and getting to the park well before the opening ceremony. We love the opening ceremonies and always try to get a good viewing spot. Eric is correct, you can beeline to the top attractions and ride them with no or minimal wait for the first few hours. We generally leave the park around noon and head back to our condo for lunch (saves money and waiting in food lines). We swim and/or sleep and then head back to the parks around 6. During Spring Break it is hot and the people that are in the park all day are burned to a crisp or heat stroked by 6 and head home. The result is smaller crowds in the evenings. Either way, if you relax and enjoy the small things all the parks have to offer you will still have a great time. Opening ceremony? I would love any info. I didn't know such a thing existed. Thanks! It's a real treat and sets the stage for a great day in Magic Kingdom! Here is a video.